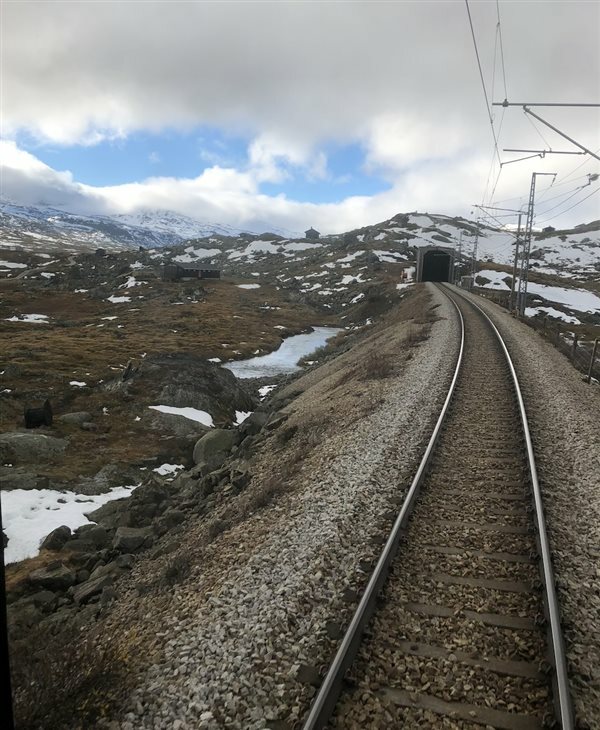 After spending five days riding nearly all of its main lines, I feel confident in saying that Norway should advance to a higher spot on any train travel aficionado’s bucket list. Not only did I find the scenery on each line more spectacular than the previous one, but I was pleased by how well-run the Norwegian State Railways (NSB) seemed to be overall. Nearly every line is mostly single-track and handles a significant volume of freight traffic, but passenger trains are scheduled and dispatched so that they run reliably and reasonably frequently. Rather than attempt grandiloquent descriptions of the landscapes these lines traverse, I will let my phots do the talking. 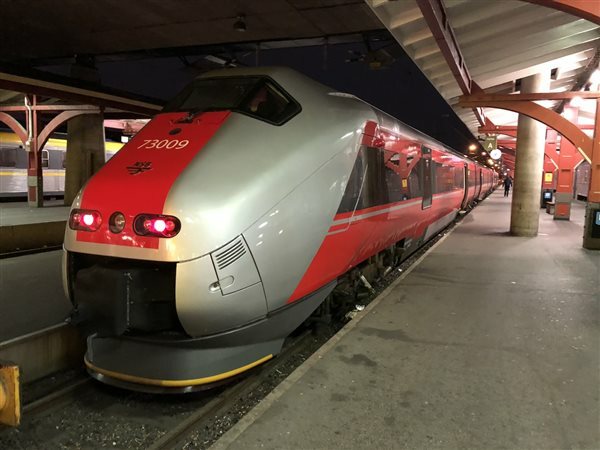 The 12:30 PM NSB Regional train to Trondheim prepares to depart Bodø station on Oct. 12, 2018. All photos by Malcolm Kenton. The core of Norway’s rail network is five lines radiating in five directions from Oslo, the country’s capital and largest city. Two of these lines cross the border into Sweden to connect to that country’s two largest cities, Stockholm and Gothenburg. 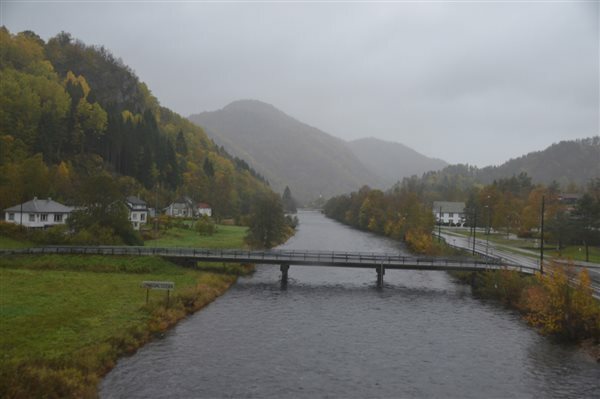 The other three reach coastal cities to the east and north — the 339-mile Sørland Railway hugs the southern coast to Stavanger, the 308-mile Bergen Railway goes due east across a mountain range to its namesake city, and the 344-mile Dovre Railway goes due north to Trondheim, located on a large fjord. From Trondheim, another line, the 453-mile Nordland Railway, stretches farther north, across the Arctic Circle to Bodø (pronounced “BOO-duh”). This is the only main line that is not electrified. 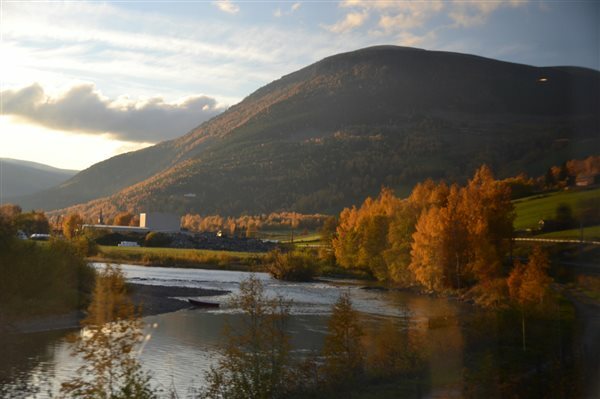 Each of these main lines hosts four daily end-to-end regional passenger trains in each direction (except the Nordland line, which hosts three), as well as more frequent local service for the first 50 miles or so out of each endpoint city. On the lines with four trains, each endpoint enjoys a morning, midday, mid-afternoon and late evening departure. The longest end-to-end trip of these is the Nordland, which takes 10 hours. The Dovre and Sørland lines each take eight hours and the Bergen takes six. 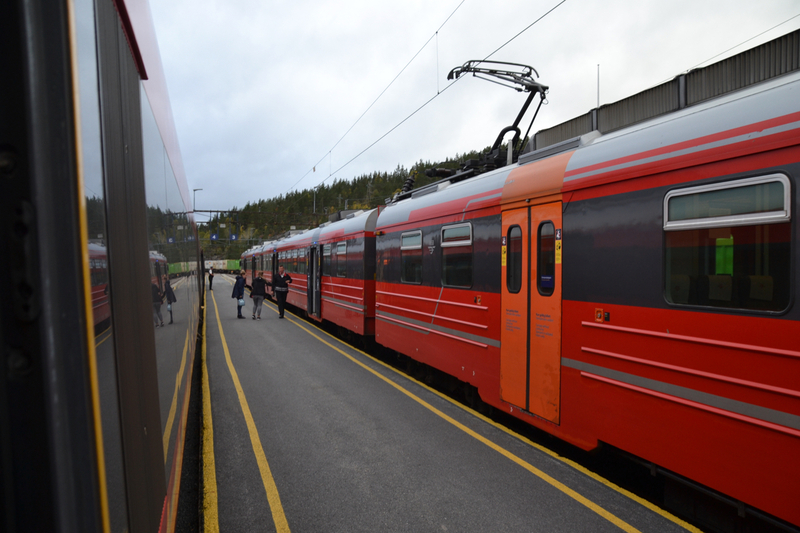 Regional trains are generally locomotive-hauled, except for some on the Sørland Railway which use Class 73 tilting EMU trainsets, built by Adtranz in the late 1990s and early 2000s. On the other routes, the coaches were built by Strømmen in the late 1970s and early 1980s. 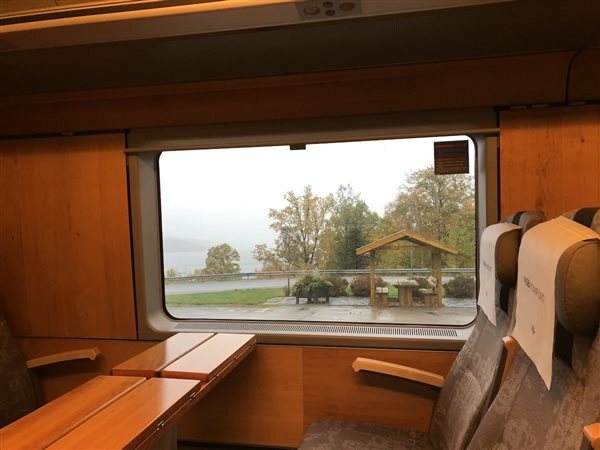 The room-facing side of a WLAB2 sleeping car, on pre-dawn arrival at Stavanger from Oslo on Oct. 9, 2018. The evening departure on each of these lines is an overnight run that carries sleeping cars. When I visited in early October, each overnight train had two sleepers, while the one on the Dovre Railway carried three. Each of these 1987 Strømmen-built ‘WLAB2’ sleepers is identical, with 15 double bedrooms with in-room sinks and one toilet on each end of the car (no shower). Each room has a narrow window above the sink, while the hallway has a smaller window atop a larger one, reminiscent of Amtrak’s Viewliners (though not as high), and fold-down seats next to the windows. Each berth costs a supplement of about $113 USD (at the current exchange rate) atop the base rail fare for an end-to-end trip. 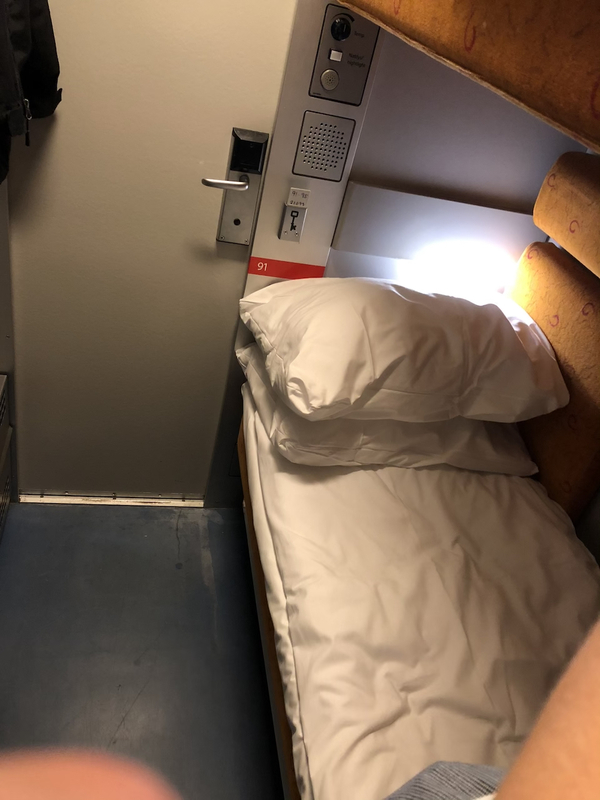 When a sleeper passenger boards the train, s/he must check in with the conductor in the cafe car to receive a plastic key card that unlocks the door to his/her assigned room, which is already in nighttime configuration with beds made. 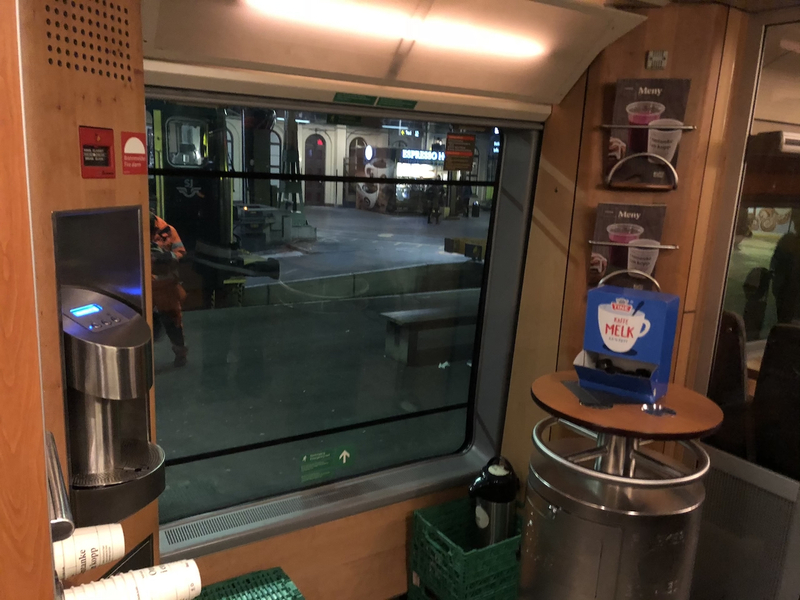 The cafe car on the overnight trains remains open and serving all night, with a smaller menu than that offered on the daytime trains. Enjoying a heart-shaped waffle cheese sandwich with Norwegian spring water in a comfy cafe char facing this oversized window traveling towards Oslo on the Sørland Line on Oct. 9, 2018. As for the food and beverage, the NSB Kafe offers a decent selection of mostly lighter fare. The vegetarian choices (meat, poultry & fish have been absent from my diet for two decades) were somewhat limited, but I enjoyed the veggie pizza, the vegetable chili, and the cinnamon buns and heart-shaped waffle cheese sandwich (both Scandinavian favorites). I was particularly impressed with the craft beer selection, which included one brewed specially for NSB by a Drammen brewery whose name translates to “Speeder Ale” (as in the track maintenance vehicles). Alcohol must be consumed at the tables or bar seats in the cafe car, but all other items can be taken to one’s seat or sleeper and consumed there. The longer-distance day trains consist of one first class (“NSB Komfort”) coach, one family coach (“NSB Familie”) with a children’s play room, and four to six regular coaches, plus the cafe car. The seats are exactly the same in both classes (they are nearly identical to the first-class seats used on Deutsche Bahn’s ICE trains), but NSB Komfort on the Strømmen coaches has 1.5 times as much legroom as economy with seats that better align with the large windows, for an upcharge of about $15 (or included with a first-class Eurail Pass). On the Class 73 EMUs, there is not much difference in legroom between economy and Komfort. 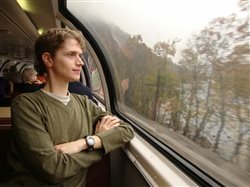 Advance reservations are mandatory on all longer-distance trains in both classes of service, including for pass holders. 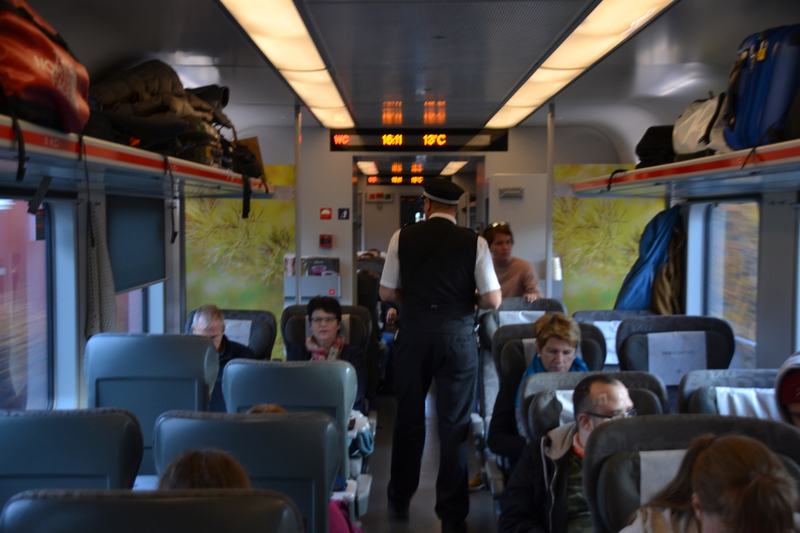 Tickets & reservations may be purchased online or with NSB’s mobile app, but Eurail Pass holders must make reservations over the phone or at a staffed ticket office in Norway. 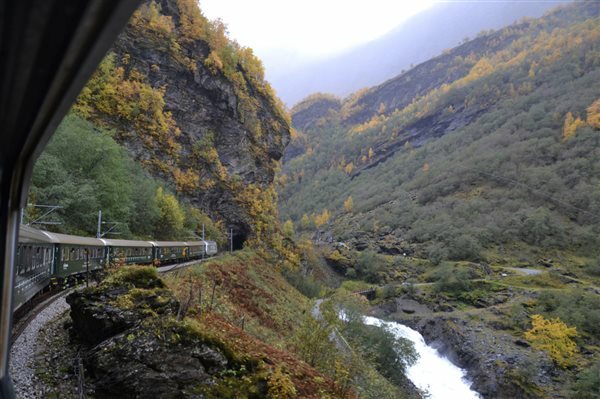 The morning NSB Regional departure from Bergen, bound for Oslo, calls at Myrdal station (the summit of the connecting Flåm Railway at 2,831 feet above sea level) on the grey morning of Oct. 10, 2018. 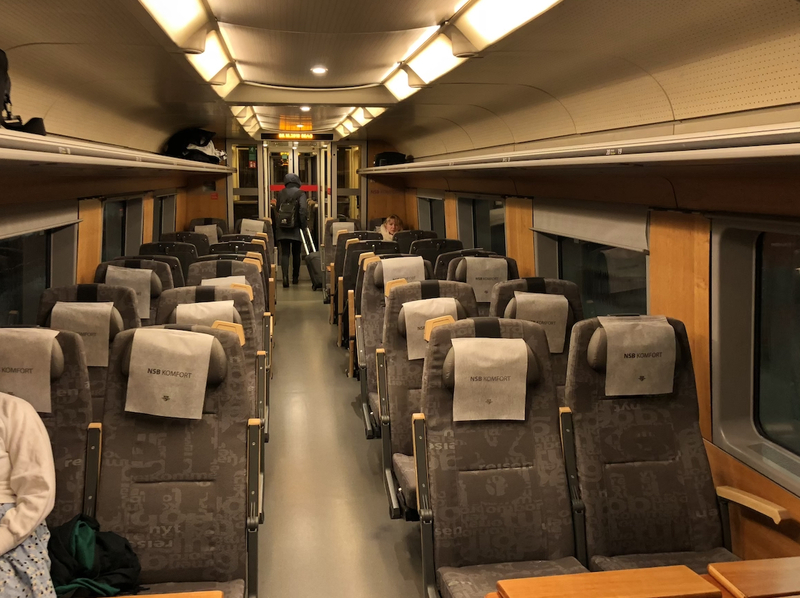 One question I was left with is how come no private luxury train operator (such as Belmond, which operates the Orient Express, Royal Scotsman and others) or cruise line operates either private trains or private cars behind regular NSB trains in Norway. The scenery is an ideal backdrop for a world-class upscale service, which would work well in combination with the many cruises that ply Norway’s fjords. However, Norway seems completely lacking in the franchisee and open-access train operators that abound in neighboring Sweden, where they compete with national operator SJ on all the principal routes. One of the Swedish operators, Blå Tåget (“The Blue Train”), offers a more upscale vintage train with formal dining car between Gälve, Stockholm and Gothenburg. 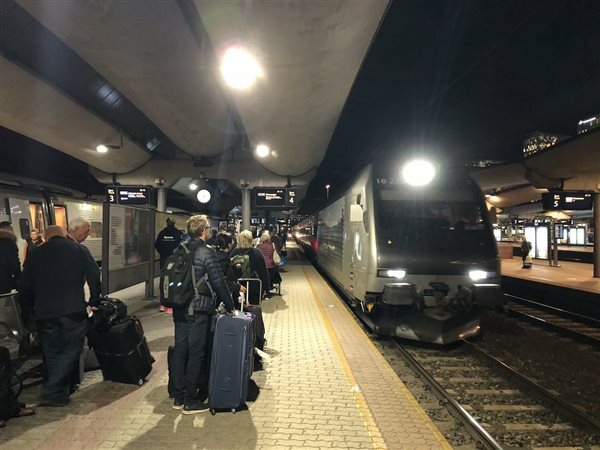 The 6:25 AM NSB Regional to Oslo, with a Class 73 tilting EMU consist, prepares to depart Gothenburg, Sweden's Central Station on Oct. 8. 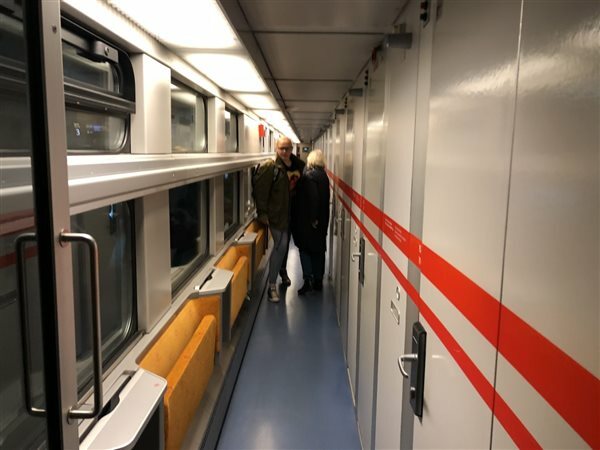 Interior of the NSB Komfort coach on a Class 73 EMU. The cafe alcove in the NSB Komfort coach on a Class 73 tilting EMU train, where complimentary coffee, tea and hot chocolate (but not water) are available to first class passengers. 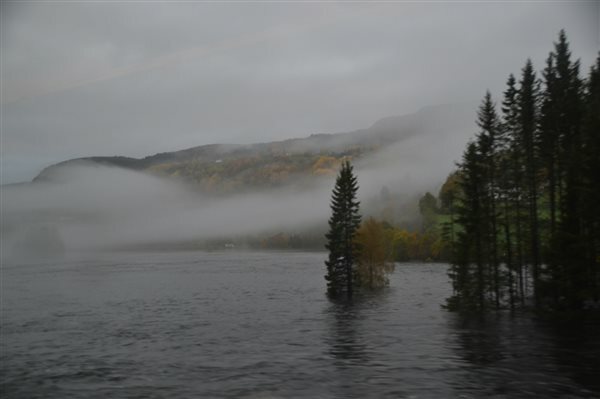 View from the window of the Gothenburg-Oslo cross-border NSB Regional in west-central Sweden on Oct. 8. 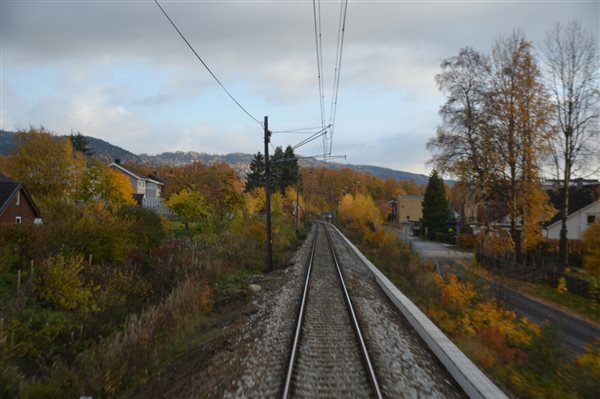 Scene along the Sørland Line near Kristiansand on the southern tip of Norway, Oct. 9. The NSB Regional train from Moi to Oslo meets an NSB local train at Kristiansand on Oct. 9. The aisle of a WLAB2 sleeping car, with duplex windows and foldout seats. Lower berth bed in one of the 15 double bedrooms on the WLAB2 sleeper. 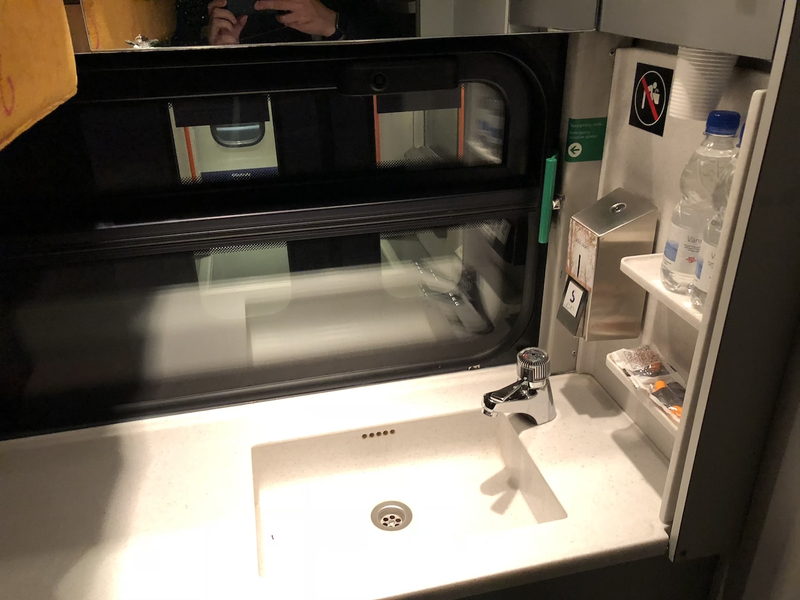 Sink next to the window at the foot of the lower berth bed in a WLAB2 sleeper. Sleeping car passengers are provided with a hand towel, earplugs, cups and a bottle of water. The 11:30 PM night train to Bergen pulls in to Oslo Central Station 20 minutes before departure on Oct. 9. 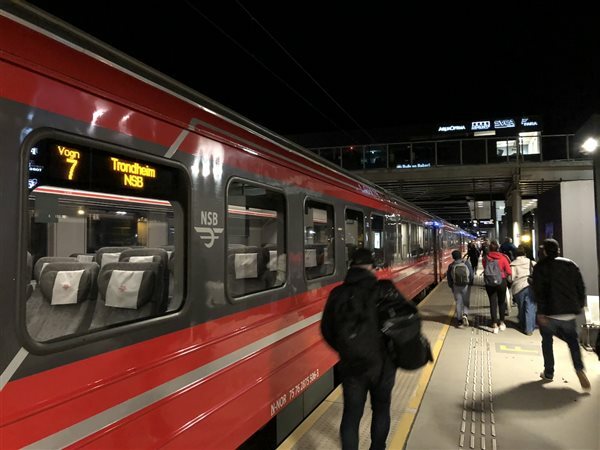 The arriving night train from Oslo (left) is across the platform from a Voss-bound local at Bergen station during the pre-dawn hours of Oct. 10. 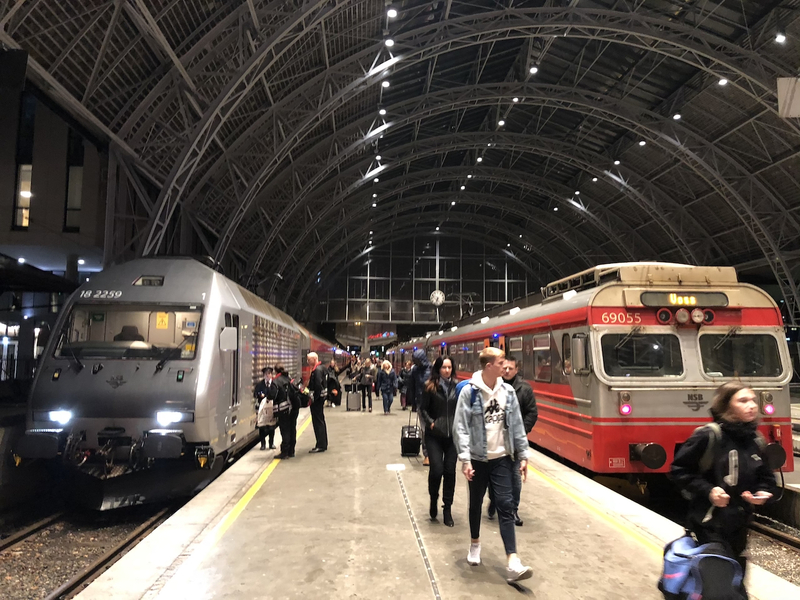 This is the grandest trainshed in Norway. View from the Bergen Line along a fjord about 20 miles from Bergen on the grey, misty morning of Oct. 10. View from the spectacular Flåm Railway, which is tourist-oriented and gets a lot of its ridership from cruise lines, on Oct. 10. 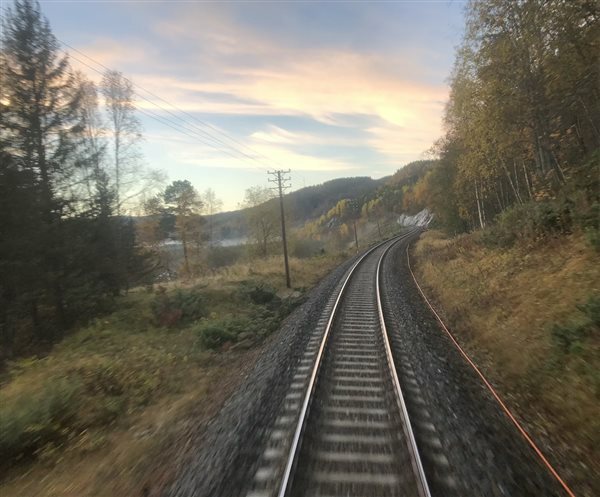 Rear view near the 4,500-foot summit crossed by the Bergen Railway between Bergen and Oslo, on Oct. 10. Interior of a nearly full Strømmen coach on the Dovre Line bound for Trondheim from Oslo on Oct. 11. View from the rear of the Trondheim-bound NSB Regional on the Dovre Line north of Lillehammer on Oct. 11. A dusk view from the Dovre Line along Gudbrandsdals Lake on Oct. 11. The afternoon NSB Regional from Oslo arrives at Trondheim at 8:00 PM on Oct. 11. Passengers connecting to the 11:00 PM night train to Bodø (as I was) have a 3-hour layover here, which I used to get dinner and walk around town. 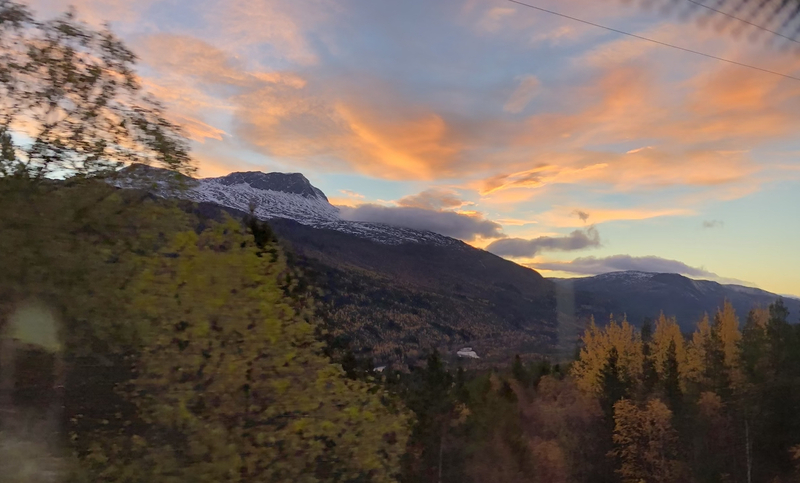 Sunrise in the northern reaches of the Nordland Line, from my sleeping car heading towards Bodø from Trondheim on Oct. 12. 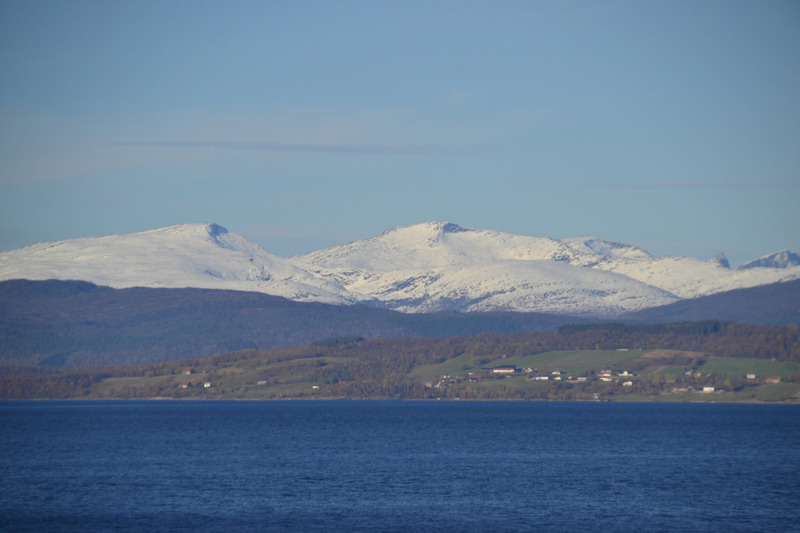 View from the northern end of the Nordland Line near Rognan on Oct. 12. 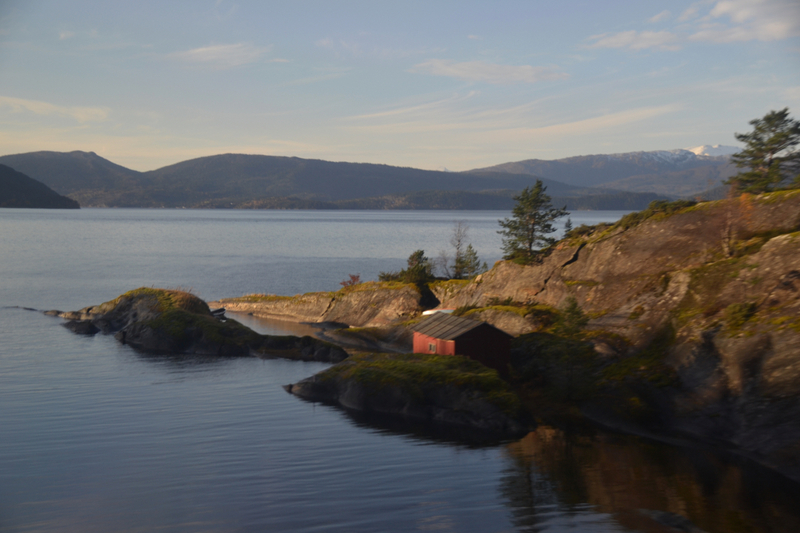 View from the Nordland Line along Saltdals Fjord on Oct. 12. 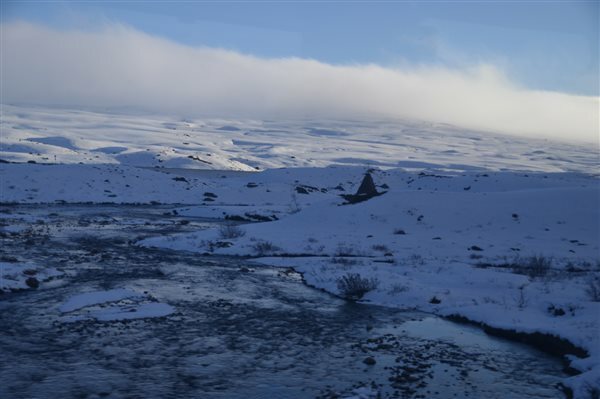 Wintry view of the river Luonosjåkhå near the highest point of the Nordland Line, where it crosses the Arctic Circle (marked by the stone obelisk near the center of the photo), on Oct. 12. 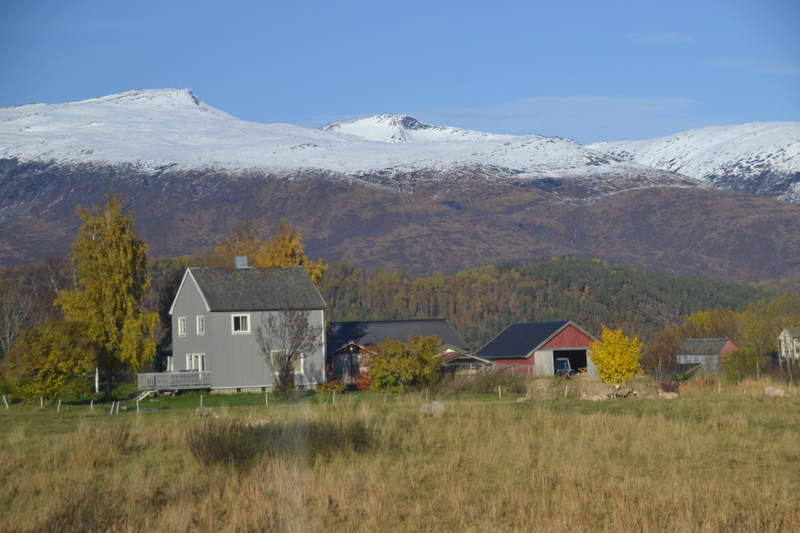 View from the Nordland Railway along Ran Fjord southwest of Mo i Rana on Oct. 12. Morning rear view along the Nordland Railway near Røkland.